The college football world has been rocked by the recent 15-foot-fall and injury of expected first-round NFL draft pick Robert Nkemdiche in Georgia. According to a report from ESPN, Nkemdiche (pronounced “kim-DEE-chee”) fell from a hotel balcony at the Grand Hyatt Atlanta after breaking through a double-paned window. Nkemdiche, an all-star defensive lineman for Ole Miss, may not be able to make the team’s New Year’s Day Sugar Bowl appearance against Oklahoma State. But that’s not the worst of Nkemdiche’s problems; he may be looking at fighting a felony charge and fifteen years in a Georgia prison. The ESPN story says Nkemdiche was found to have “seven rolled marijuana cigarettes, rolled in Cigarillo Blunt papers”. While Georgia is a stringent marijuana prohibition state (unless you’re an epileptic child using low-THC / high-CBD cannabis oil), it does only mandate a misdemeanor with a possible one year in jail and $1,000 fine for possession of less than an ounce, which seven blunts likely are. Outkick has been told that Nkemdiche, after using the synthetic cannabinoids, was paranoid and convinced someone was chasing the 6-foot-4, 296-pound defensive tackle when he broke through his hotel room windows and plummeted more than 15 feet to the ground. Had Nkemdiche not landed on a bush outside the hotel, his injuries would have been much more severe. Denzel, a senior linebacker on Ole Miss, was hospitalized after he was found near the edge of the roof of his off-campus town home, wrapped in a blanket, terrified that someone was after him, Outkick has learned. Denzel missed the final two games of the season. 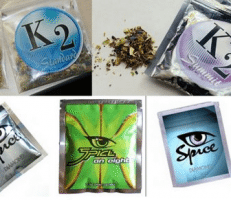 These synthetic cannabinoids, this “Spice” or “K2” and its equivalents, are often used by people who want to get high but avoid getting caught on a drug test. Unfortunately, these synthetics were meant only for laboratory conditions, where cannabinoid receptors in research animals need to be hyper-stimulated in a short period of time in order to discern potential effects. They’re not meant for human consumption (the package even tells you this). Where a hit of natural weed is a consistent tickle for your receptors, a hit of Spice or K2 can be anything from a light slap to an unblocked body-slam from Robert Nkemdiche to your receptors. It’s inconsistent. If you enjoyed one Spice packet from a couple hits, the next time you take a couple hits from a different package could be an entirely different and extremely unpleasant experience, even potentially deadly. The charge now is marijuana possession, but if those blunts are later found to have been rolled with Spice or K2, Nkemdiche could be in a lot more trouble. In 2012, Gov. Nathan Deal signed a new law making possession of synthetic cannabinoids a felony with a potential two-to-fifteen years in prison. And to add insult to Nkemdiche’s injury, he plays football at the University of Mississippi, the only place in America where it is federally legal to grow natural marijuana.